I am wondering if I should start to write a weather log as that is so often the dominating subject of the bulb log. As I have explained, our weather in Scotland can swing very dramatically, especially at this time of the year, and two hours can see a change from sunshine in clear blue skies and temperatures in the mid to high teens to extremely cold damp conditions with temperatures hovering just above zero degrees C. It only takes one or two warm days for the bulbs to spring into growth and the garden and glasshouses are bursting at the seams just now, I have taken over 200 pictures in the last week because there is so much in flower to record digitally. The swinging weather is far from ideal for most of the bulbs but some are more susceptible to the cold damp conditions than others. This is a form of Fritillaria hermonis amana which, as you can see, has become badly infected by botrytis both on the leaves and the flower. I will manage to bring it through, I hope, but it will be weakened and it will take me a few years to build it back to a healthy stock. 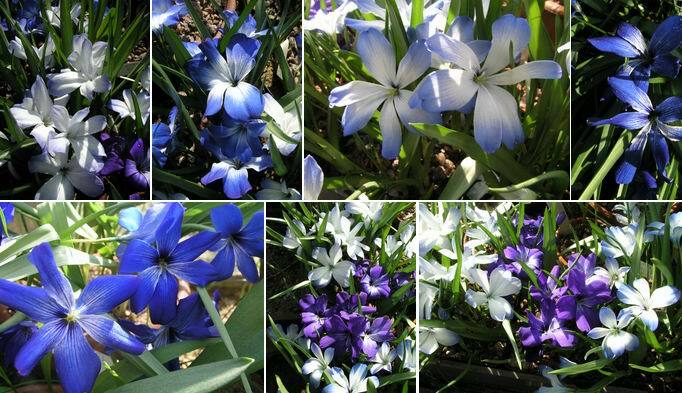 As gardeners we expect our bulbs to grow well, flowering freely and increasing every year. I have learned that this is an unreasonable expectation and reflecting on what happens in the wild, I conclude that it is also unrealistic. How often have you heard of someone heading off to Spain or Turkey with all the directions of how to find the best sites of spectacular flowering bulbs only to find the odd squinny flower? It happens in the wild too, some years the bulbs are enjoying ideal conditions and perform spectacularly and other years they are barely surviving. Fritillaria are often the most affected by these poor growing conditions which we have no control over, we just have to adjust our watering regime to try and accommodate the swinging climate. 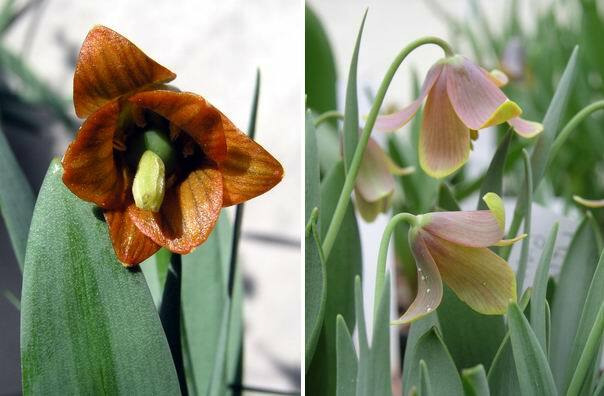 Fritillaria pinardi is a very variable species and you can quickly build up a collection of twenty or more pots of different forms. The one to the left was raised from Jim and Jenny Archibald's seed and is flowering for the first time for us; the picture fails to capture the stunning metallic orange of the flower. 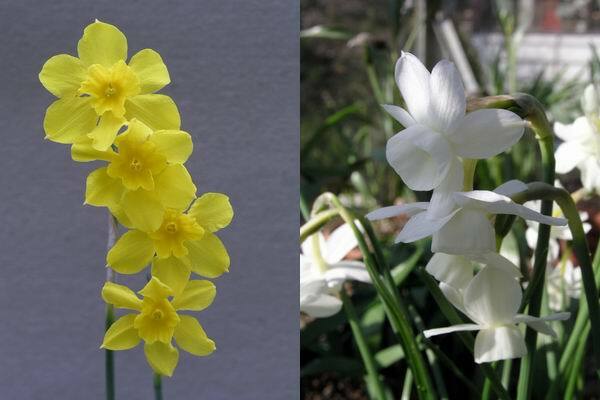 The right hand one is from another great bulb name, the late Ole Sonderhousen (OS477), it is a very attractive short form that would look very well on a show bench. On the right is a yellow form of F pinardii again displaying the flared petals often seen in this species. To the left and looking superficially similar to a pinardi is F. rixii note how the style is clearly split into three branches at the end while the pinardi has more of a club shaped style. What we have to remember is that as the fritillaries are in flower the new bulb is just starting to swell. 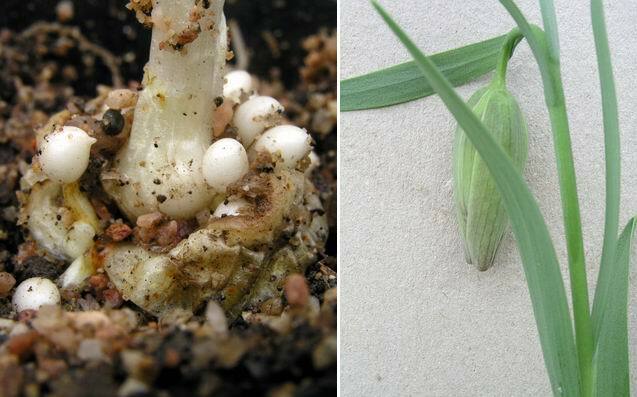 This is the bulb of the flower on the right and you can see the rice grains well formed on the old scales which are now starting to wither at the same time the new bulb is starting to form at the base of the flowering stem - you can see the swelling clearly. We need to ensure that the plant has plenty of moisture and food in the form of potassium (potash) to build next years bulb. If you have a similar erratic climate to us you will know that it is not always easy to know when to water the bulbs. Ideally I like to water early in the morning of a bright dry day when the surplus can drain and evaporate away, but, it is so often the case that the day after I have watered will be very cold and damp and that is the problem we have to face. Luckily I find that most of the narcissus that we grow in pots are better able to tolerate our weather pattern than the frits. 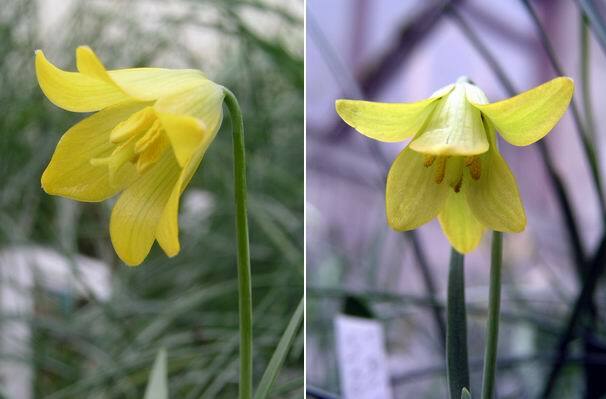 A nice form of Narcissus jonquilla on the left fills the bulb house with scent and on the right is my own hybrid between N. triandrus and watierii, 'Craigton Coquette', well I just think it is beautiful. 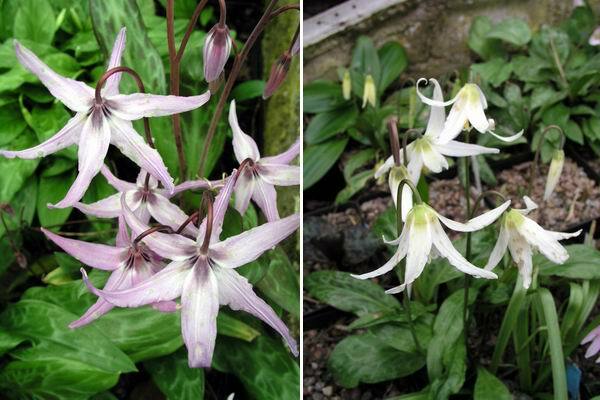 Outside we are approaching the peak flowering time for the erythroniums and if you look carefully you will see from the brown spots on the petals of Erythronium hendersonii (left) and oregonum that they do not enjoy the cold damp conditions that much either. Poor conditions at flowering time usually results in a poor seed set for two reasons, firstly there are fewer insects out in the bad conditions to help pollinate the flowers and secondly low temperature does not encourage the pollen to grow down the tube to fertilise the embryo seeds in the ovary. 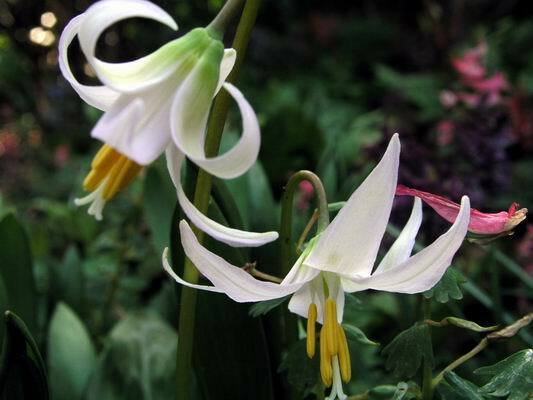 No amount of bad weather, however, can stop me enjoying my erythroniums. 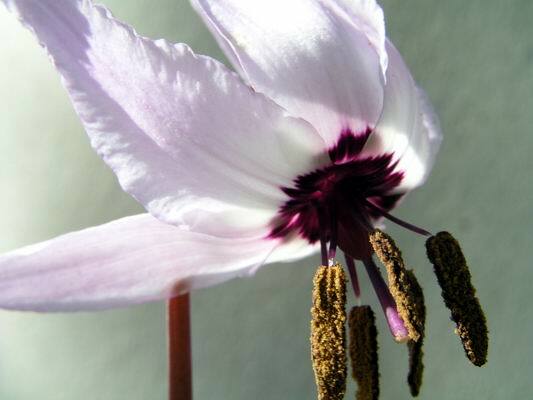 Always among the first to open is the stunning Erythronium hendersonii which has that irresistible combination of dark velvety purple against a pink to white back ground. No matter what type of flower it is found in, this colour combination is widely accepted as being among the most beautiful - think of Paeonia rockii, various Nomocharis and some rhododendrons. Look carefully and you will see that the ripe brown pollen has already found its way on to the style, let us hope that the nature and the weather is kind and I will get a good seed set on this much sought after bulb. 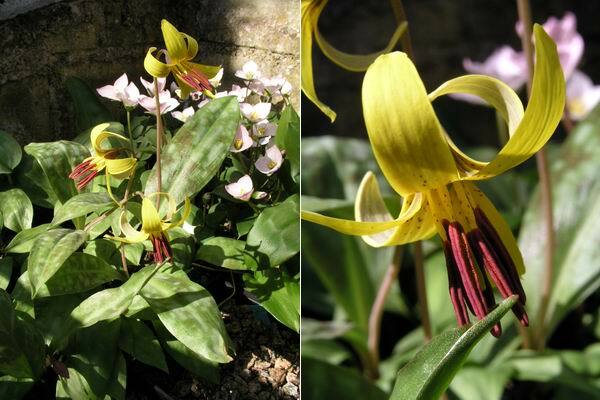 Erythronium oregonum comes in many different forms from this well marked form with bright yellow anthers to greeny yellow ones with cream anthers, which I have often seen wrongly named as E. citrinum in the UK. Note the filaments that hold the anthers and pollen in the picture above are wide in the middle and taper towards the anther end, in E. citrinum the filaments are uniformly thin and thread like. This is a very pale form of Erythronium revolutum it has the slightest tint of pink making it the nearest to a white form that we have raised, I prefer the deep pink forms but it is good to see mixed plantings with all the colour forms growing together. 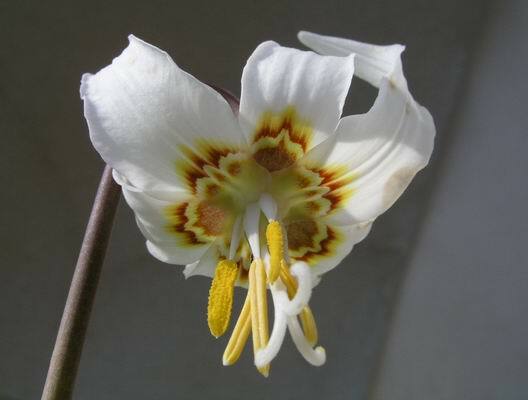 Erythronium americanum is sadly most often represented in cultivation by a poor flowering form that spreads rapidly by stolons producing patches of nicely marked single leaves. I have been working for many years to get forms that flower well and we now have several different clones that flower every year, like the one above. They have deep yellow flowers with brown spotting towards the centre, also note that some forms have brown spotting on the filaments like the above. I am continuing to build up my digital images of plants and am amazed at the detail that can be seen on the PC screen. 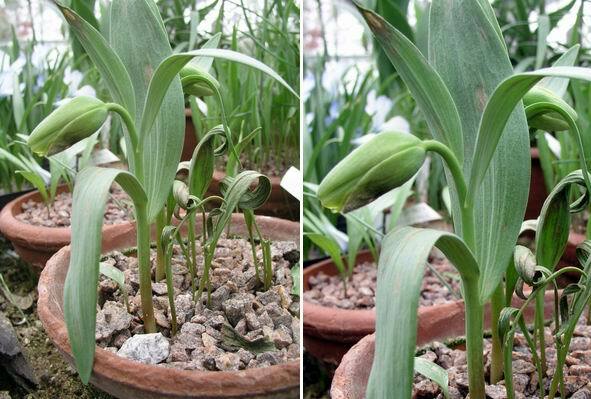 It was while recording the leaves of Erythronium americanum that I noticed a pattern of white, pore-like spots seen best on the right hand picture. I have never noticed this before, perhaps because it requires some magnification. This just further demonstrates to me how digital photography has now overtaken film based photography as the best medium for recording plants. I will leave you with a montage of some of our forms of Tecophilaea cyanocrocus and the news from our weather forecasters that freezing conditions and snow is due by the weekend - yuk!